Image by Sid05 via FlickrI know, some of you might be annoyed by that repeating changes. I'm going to make some minor modifications in the theme, mostly regarding the color, today. Maybe today, or in the coming days, I'm thinking about to integrate a better comment-system, to bring the Twitter and Facebook-comments into the blog. So please just ignore some strange things happening here. I hope you like the new colors. I'll have to get rid of the grey. And no, it will NOT look like on the picture here :). 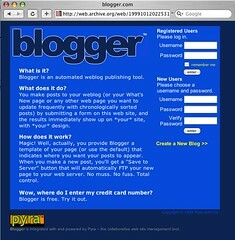 That's a screenshot from the really old pre-Google blogger-service. Thanks to Sid05 for releasing this under the CC License BY-NC-SA.